Just upgraded to the latest build of UDK since I'm still in Content Creation, and haven't committed too many assets to the engine yet. One feature I hadn't played with at all til today was Lightmass. 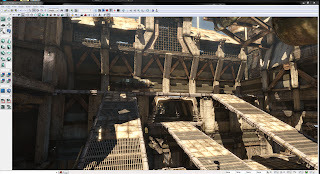 Lightmass is a new system for creating the baked-in lightmaps for level geometry. 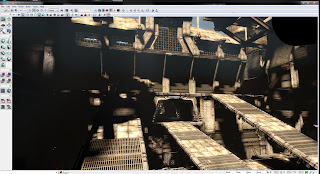 Unlike the old system, which used purely direct lighting (requiring individual lights for all lighting effects), Lightmap uses global illumination to create more realistic effects. The results are pretty incredible. These shots are from the DM-Deck map that ships with the UDK. The only work I did was rebuild the lighting with and without Lightmass. It's amazing to see how good the lighting looks in comparison to the old system. As an added bonus, Lightmass comes with a network redistribution feature, so I can shunt some of the workload onto my lappy and speed the process up. As a comparison of build time, the old system lighting rebuilt in just over a minute, while Lightmass rebuilt in about 15.